Your organisation invests valuable time and resources into the hiring process, wanting final decisions based on more than impressive resumes and positive hunches. You need to be confident that candidates possess the competencies needed for immediate performance on the job. However, typical interview practices do not distinguish performers from non-performers, often resulting in ineffective and costly hires. Standardise interview preparation, execution, and evaluation at all levels throughout your organisation. Make the right people decisions. Interview preparations: identify interview criteria including critical competencies, skills, experience, and perspectives. Structured interviews: ask competency-based, standardised questions, and listen for specific responses. Post-interview evaluation: use data-based rigor to compare candidates. 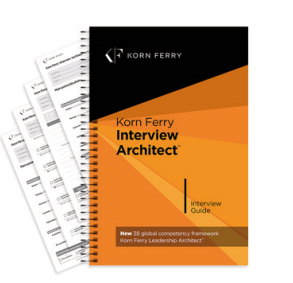 Interested in becoming certified in Korn Ferry Interview Architect ?